Turbo’s new “hammer,” a Samsung Chromebook that he loyally bought from IBM client Best Buy when he was supposed to be out just grabbing lunch. Read the full post to determine whether Todd will keep his new hammer and whether or not it’s worthy of a life lived mostly in the cloud. I’ve not written a personal technology post in a couple of weeks, but I had occasion to acquire some new technology recently, and I decided that must change. First things first: Never let me loose in a Best Buy with a credit card. It’s not a pretty sight. Which is precisely where I found myself last week during a lunch break, when I allegedly stepped out to get some food. And to be fair, if not to myself, then to the telling of the tale, I didn’t wander into the Best Buy without having in my mind’s eye a certain technology I wanted to check out. Mind you, I never had children, much to my mother’s chagrin, so my indulgence IS the acquisition of new technologies, of all varieties. I could open a museum dedicated to the long dormant carcasses of technologies past. Some of them I could make a good argument at the time I needed them, others I would have a difficult time in making that case to a mock court filled with sympathetic nerds. But regardless, it is my passion and weakness (that, and golf). Now for my juicy rationalization on this particular lunch break: Though I didn’t need a new computer, I wanted to try something new. That’s as rational as it’s going to get. Hey, it’s better than going out and buying a Porsche on a lark, right? Or a motorcycle of some kind, which would surely get me killed! At least this Chromebook won’t kill me, I thought as I walked through Best Buy the parking lot. So I walked into the Best Buy and *specifically* wanted to check out the Chromebooks. That would help me limit the damage. I already told you, this wasn’t an entirely rational act, although there was plenty of rationalizing as I went through the door. Also, how’s this: Best Buy is an IBM client! When I buy stuff from Best Buy, I’m helping support a customer who helps support me because they buy our stuff! That’s pretty good, you must admit. I was about to close the deal with myself and I hadn’t even yet seen the Chromebook. By now, I’ve walked past the mobile phone section of Best Buy, which for me is like a person who has a gambling problem having the willpower to walk through Caesar’s Palace without stopping at a blackjack table. But I did it. And I kept on walking…past the 3D TVs, the Internet-enabled fridges, past the camera section (Wait, I’ve not bought a camera at least in a year! ), and on into the computer section. I asked the friendly sales guy if they had any Chromebooks on display, and he said, in fact, they did. Two models, one from Samsung, and one from Acer. The Samsung had a 16GB hard drive, and the Acer, I think, a 128GB drive. Of course, you’re missing the point with a Chromebook if you’re thinking about how much hard drive space there is. The whole point of a Chromebook is to live almost entirely in the cloud. That and to support one of IBM’s great clients, Best Buy, by buying more stuff from them. Our client. Who buys our stuff. I know, I have a problem. I just want you to know how my mind works. The nice sales guy answered a bunch of questions I had, machine gun fashion, Amy Poehler style, and then mentioned they had an “open box” of the Samsung, a return. “Why’d they return it?” I asked him. Then, I saw the price. $216!!! Aha, even better, I was going to benefit from the misery of another customer who had returned the thing because they didn’t understand they were going to have to live in the cloud. I could feel my credit card literally melting in my back pocket. Like it was oozing between the seams and burning down my leg like hot wax. “Thirty days,” he smiled. Well there you go! If I don’t like the thing, I’ll bring it back (Fat chance that was gonna happen, but it gave me an out). The sales guy left me there to play with the Samsung Chromebook some more, but it was a no brainer! $216 for an item that was listed at $249 and for which I’d seen folks charging close to $300. So I bought it, the endorphin rush carrying me out the door back to my car. It was supposed to come with 100 GB of free storage from Google for two years, but because it was an open box, the doofus who bought the thing and returned it, had cashed in the free storage and I was left to buy my own. That’s okay, because as it turns out, I don’t need a lot of storage. I’m mostly saving small text docs. And now, let me explain my net summary of the Chromebook experience thus far. First, I’m a writer, first and foremost. So I like writing on something I like to write on. Whether a typewriter, in a specific word processing app, or on a keyboard that has just the right feel…well, that’s the point: You know it when you feel it. 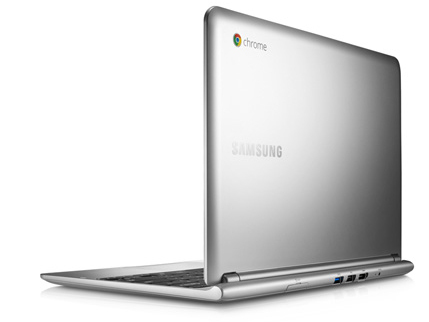 The Samsung Chromebook has the right feel, for me. Second, less is more. For basic productivity, so long as you have a good Internet connection, most everything you need is in the Chrome cloud. IF you need anything else that’s specifically hidebound to Mac OS or Windows or even Linux, the SAMSUNG CHROMEBOOK IS NOT FOR YOU! Third, I haven’t had to try and use it offline yet. Though I’m told a number of the Google apps work great offline, I haven’t yet gone there. So, stay tuned for more on that. The ONLY thing that doesn’t yet work that I want to work is Netflix…and, I’m told, Google’s working on it (they’re having to do some recoding due to the ARM processor used in the Chromebook). Everything else has been great, including, as mentioned, job one, the ability to write. I found an application in Chromebook called “Writer” that’s free and that’s where I’m writing this post. My post saves every few seconds to the cloud, autosave extraordinaire, voila…no lost posts, no local OS or app crashes. And the Chromebook display is gorgeous. The multitasking is no problemo, due to the light footprint for Chrome. And you know something else, I think one of the things I like most about it is its simplicity. It just works! The operating system doesn’t get in the way, as it so often does when I’m using Windows or Mac OS or even Linux. The footprint is SO light there’s really not much there to crash! And after twenty years of fighting operating systems, I have to say, this is one helluva breath of fresh air. This is the network computer as it was being banted about in 1998, that’s actually come to fruition because the bandwidth has matched the application capacity. Ultimately, it’s pushing technology the hell out of my way so I can get real work done. What a concept! And yes, this is mainly a “second” computer for me, but it’s a powerful second computer, and because so much of my life is now spent in the cloud, and considering that a computer is for me like a hammer is to a carpenter — well, that’s how I ultimately justified the purchase: I got myself a new hammer for only $216, and I’m out there just hammering away nails like it’s nobody’s business. So before you go spending $800+ on that 128GB iPad, make sure it’s going to do what you need to do…that can’t be done on a $216 Chromebook! Bandwidth and good internet connection is the key. Thus you are limited to where you can adequately access the internet. Turbo Todd, who is a city junky, will never be far from his maximum bandwidth allowable by law, but whoa to him when he gets far from the gigabit teat. In other words, don’t be bringing that Chromebook to Boulder Creek unless I’m wanting to use it as a fishing weight! Duly noted. Love this line “Of course, you’re missing the point with a Chromebook if you’re thinking about how much hard drive space there is.” I just purchased a Lenovo i7 w 8 GM RAM. I do some crazy stuff in Excel and my 5 yr old Mac blew up. But I’m ready for a Chromebook.